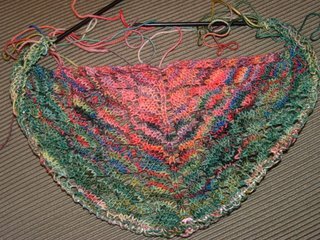 The shawl is quickly growing. The pattern only has 152 rows and I'm on row 74. There aren't any schematics or measurements included in the pattern so I dont't have a clue as to what the finished size should be. I've still have been unable to wrap my brain around the craziness of the varigation. 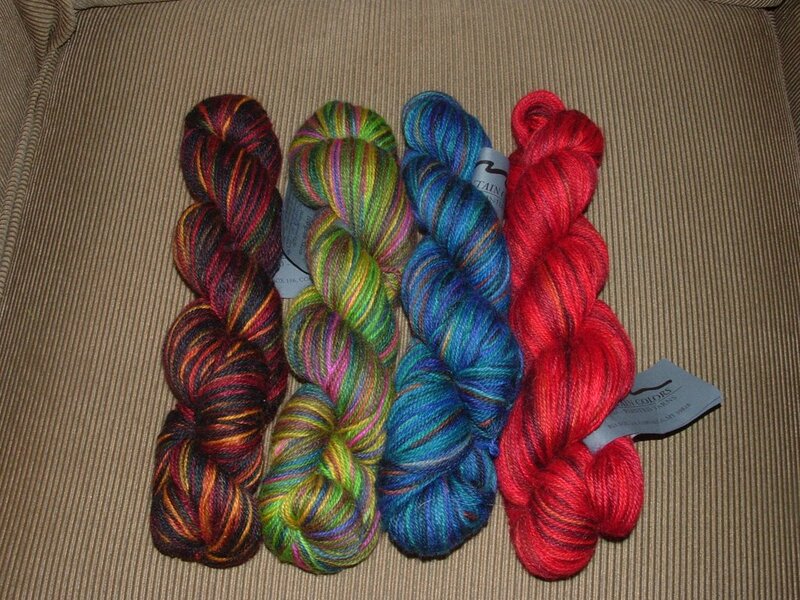 The number of colors used in a single skein is mind boggling. I have a copy of Handpaint Country, which I consider my visual introduction to the world of handpainted yarns, and have seen pictures of Koigu on the internet. Ain't nothing like the real thing. So far I've used 4 of the 5 colors. The first two colors are much deeper than they appear in the photo because I had to use the flash to get a good shot. Unless I'm knitting socks I'd be very hesitant to purchase more sight unseen. I pre-shopped the "Christmas in July" sale at the lys and picked up the goodies on yesterday. (You could pick out your yarn and bag it, but you had to wait until the sale started to pay for it.) 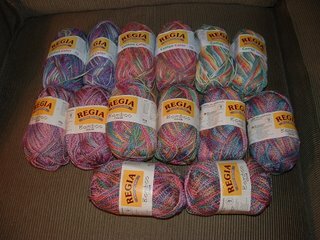 The haul consists mainly of sock yarns and some Nature Spun Sport that was on clearance with additional reductions. 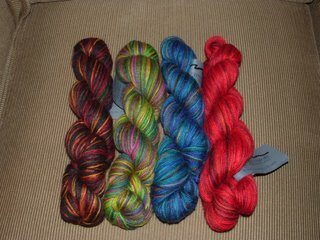 I also bought a bunch of Nature Spun Sport in assorted colors that was reduced, some natural colored King Cole Merino Blend 4 Ply for dyeing and a few other goodies. I'm glad I quit smoking. It's been almost 6 months the lys has been steadily reaping the financial benefits. 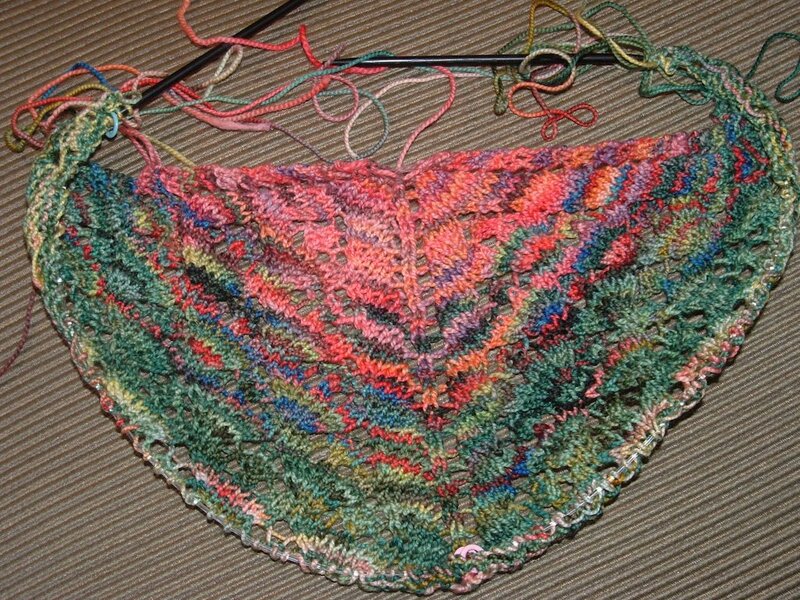 The shawl is looking great. I got a couple of skeins of that bamboo sock yarn last week. It feels so soft. I'm anxious to knit it up. Oh what a great haul of goodnes! I've never even seen or knew regina bamboo!! The koigu shawl is so lovely. COming along wonderfully. Keep showing it to us! Hi there! We decided to avoid the yarn sale this weekend. Vera helped. 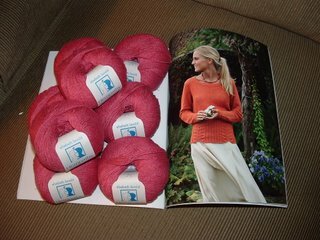 :) We visited her in Charleston instead and got nowhere near yarn to purchase. Oh yeah, I need some of that Mountain Tango!! !